One of the easiest desserts with the biggest “WOW” factor! 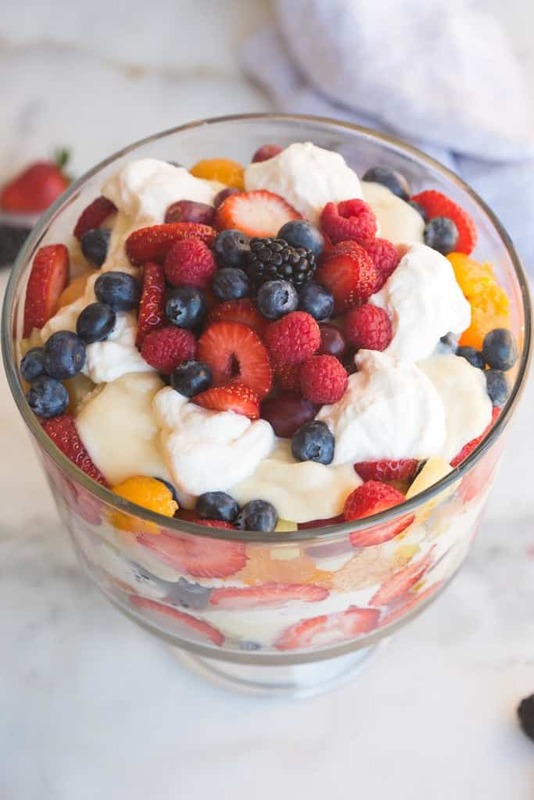 Angel Food Cake Fruit Trifle with layers of vanilla pudding, fresh whipped cream, fruit, and soft angel food cake. My mom has been in town for the past few days to help me and the kids. She helped me find time to nap, played with my kids endlessly, and helped me whip together several new amazing recipes to share with you all. I will easily admit that I continually aspire to be half as talented as her. Not only is she an incredible cook, she’s a hostess, seamstress, artist, athlete, manager (among many other things) and plays the rolls of mother, wife, grandmother and friend, better than anyone I know! She is amazing. Luckily, and after much admiration, I picked up on some of her cooking skills. But whenever she comes to visit she still blows me away with her ability to whip together amazing food with little effort, and never a “recipe” to guide her. 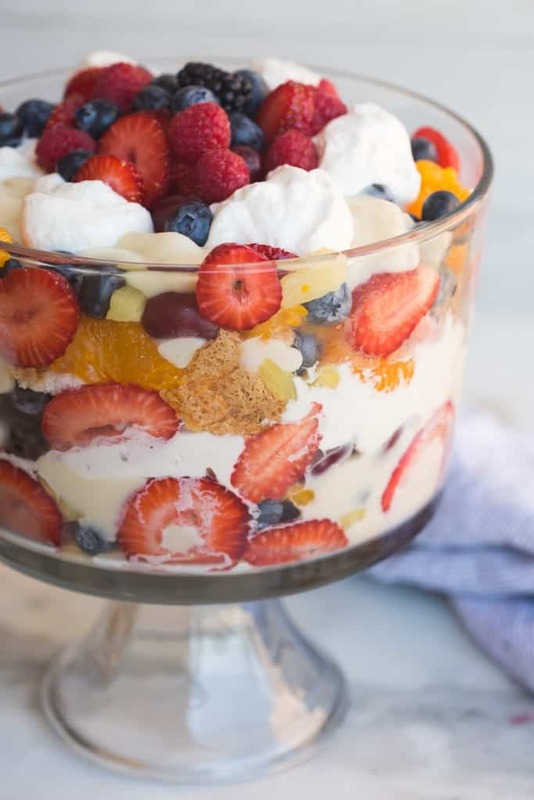 This amazing Angel Food Cake Fruit Trifle is one of my favorite things we made together recently. This was a special dessert that she made during the spring and summer when I was a kid. Not only is it gorgeous, it is DELICIOUS! I love that it has that “wow” factor to it, but is also incredibly easy to make. Perfect for any occasion, and easy to adapt to your taste. We filled it with some of our favorite fruits — strawberries, blueberries, blackberries, raspberries, grapes, pineapple and mandarin oranges–but the possibilities are endless! Add whatever fruit you like or whatever you have on hand. The fresh fruit, combined with the deliciously simple homemade vanilla pudding is dreamy. (Whatever you do, don’t skimp on the homemade vanilla pudding! It’s SO EASY and absolutely delicious!) Layer in some angel food cake–homemade or store-bought. I’m totally not against store-bought angel food cake to save time. Add fresh whipped cream and you have one of the most heavenly desserts ever! One of our family’s favorite desserts! Total bonus that it’s one of the healthier desserts you can make, too. Enjoy! One of the easiest desserts with the biggest "WOW" factor! 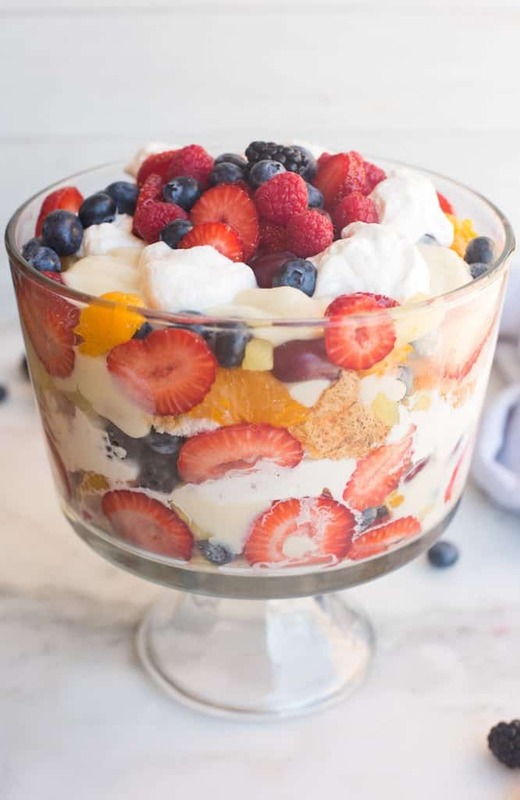 Angel Food Cake Fruit Trifle with layers of vanilla pudding, fresh whipped cream, fruit, and soft angel food cake. In a medium saucepan over medium heat, bring 2 cups of the milk to a boil. While the milk is heating, combine sugar, cornstarch, and salt in a large mixing bowl. Gradually whisk in the remaining 2/3 cup milk, stirring until no clumps remain. Add the egg and whisk until smooth. Once the milk is boiling, slowly add it to the sugar mixture, stirring constantly. Return the entire mixture back to the saucepan, stirring constantly until it comes to a simmer. Cook it for one more minute, until thickened. Remove from heat and stir in the vanilla extract. (If the pudding has any lumps you can strain it through a fine mesh strainer.) Transfer pudding to a heat proof bowl and cover the pudding with plastic wrap, pressing it directly on the surface of the pudding. Refrigerate until chilled completely. Store covered in the fridge. Cut or tear the angel food cake into chunks. Prepare fruit by washing and slicing it as necessary. Make the fresh whipped cream by adding the heavy cream to a large mixing bowl. Beat with electric mixers on high speed for a few seconds. Add powdered sugar and continue beating until stiff peaks. Stir in vanilla. To fill the trifle, add several chunks of angel food cake to the bottom of the dish. Dollop several spoonfuls of pudding around the cake. Add a variety of the fruit, followed by a few dollops of fresh whipped cream. Repeat process until the trifle is filled. (I don't bother making "perfect" layers). *You can substitute a large box of store-bought instant vanilla pudding. Prepare according to package instructions. *This trifle is completely adaptable to use the fruit you like/have on hand. I like to use strawberries, blueberries, blackberries, raspberries, pineapple, mandarin oranges, and grapes. You could add bananas, kiwi, or any other fruit you like. We made this for Easter. It is absolutely delicious and has that Wow factor. I’ve never made homemade pudding before. I didn’t know how easy and delicious it is!! Thanks Lauren! Super delicious, easy dessert with a beautiful presentation! I took this to a party and had compliments all night! 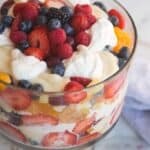 This is my go-to fruit trifle recipe!! The homemade vanilla pudding takes this dish to a whole new level! Do you have an angel food cake recipe? Can also us yellow sugar free cake. Could frozen fruits be used in this recipe as well ? 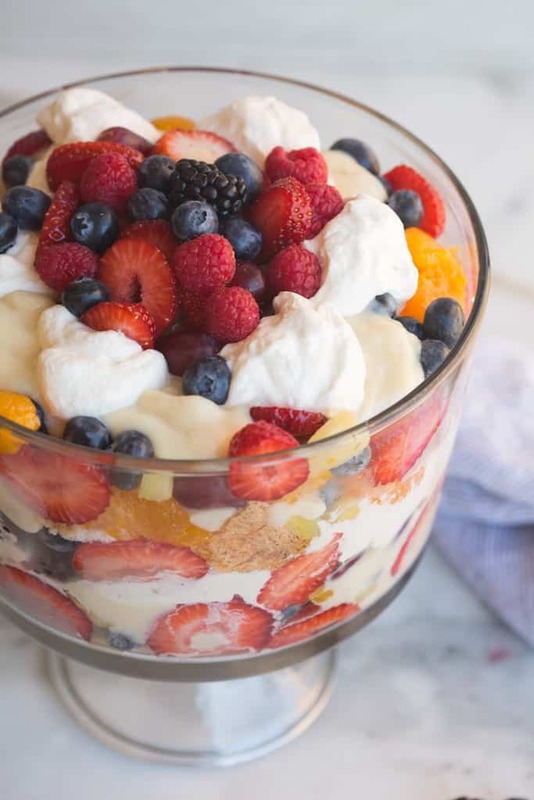 How far ahead can you assemble this trifle without it becoming soggy? I’m providing dessert and have to take it with me. Are you traveling a very long distance? It should hold up reasonable well but you could also pack all of the ingredients separately in small containers and quickly assemble it at your party! Can you make this the day before, and refrigerate? Or is it best to assemble right before you eat it? Thanks for the reply! I really appreciate it.